Microsoft threw a major curveball at Wednesday's big event, announcing not just a new, free version of Windows, but also Windows Holographic: an augmented-reality version of the operating system to be used with the top-secret HoloLens headset resulting from a collaboration with NASA. The space-age pedigree is immediately apparent: The headset's transparent display overlays windows and objects on the real world, tracking your movements and gestures as you interact with the virtual objects. The onstage demonstration seemed to work remarkably smoothly — this is no lab prototype, but a real product. The headset is wireless and less bulky than the device from virtual reality competitor Oculus, but Microsoft hasn't released any specs, so it's hard to say just how the two devices compare. Developers will be able to get their hands on the HoloLens hardware this spring but there isn't even a ballpark date yet for general availability — or pricing, though there will be both consumer and enterprise versions. More information will surely be appearing on this highly unexpected system over the next few months. 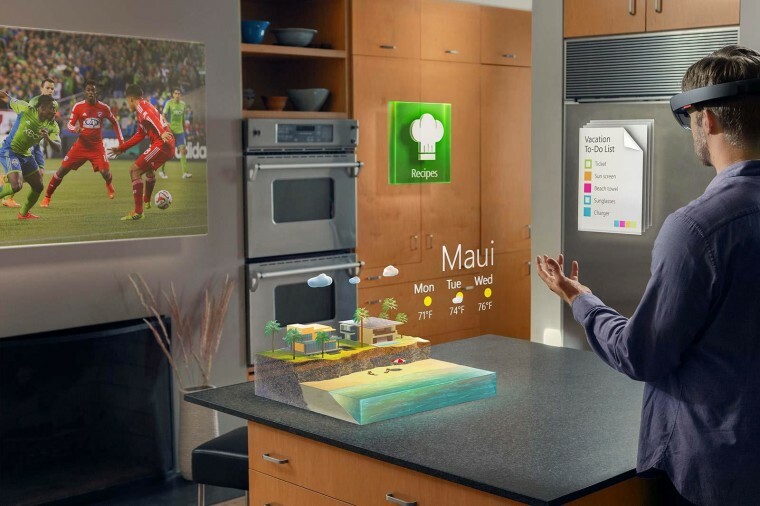 Windows Holographic is basically what everyone thought Google Glass actually did.